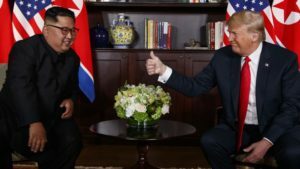 President Trump and North Korean leader Kim Jong-Un met in Singapore a few days ago and reached a “historic agreement” towards denuclearization. It is not a peace treaty, nor is it a comprehensive agreement for North Korea to dismantle its nuclear arsenal. But it is something, with the details left for another day. For these two men to have met as they did, less than a year after their testosterone – fueled war of words, is stunning. Last August, Trump called Jong-Un a “madman,” “little rocket man,” and threatened to rain down on North Korea “fire and fury like the world has never seen.” In response, Kim called Trump a “mentally deranged US dotard” and pointed to US military installations as possible targets for a missile strike. The insults were many. I still remember the days of the “axis of evil,” when North Korea, Iran, and Iraq were the subjects of our disdain and opprobrium. I also remember “beyond the axis of evil,” with Cuba, Syria and Libya forming a second group of countries deserving of our scorn. The world, and the targets of American derision, appear to be shifting. It is clear that keeping old friends and allegiances doesn’t have the same appeal for Mr. Trump. And I can’t help but think, where does that leave Cuba? Few regimes have the human rights record of North Korea. Trump acknowledged the death of Otto Warmbier, the American student who died while in North Korean custody a year ago. It is also difficult if not impossible to argue that the people of North Korea are “free to choose their own destiny.” Yet Cuba remains on the naughty list, long after the end of the Cold War from whence this all began. This almost makes no sense. Or, could it just be that “Investors [are] Eager For Economic Opening Of North Korea”? Could it be that “North Korea’s real estate potential excites a Trump”? Could it also be that the blockade was never about human rights, and everything about the Habana Hilton and the sugar economy? Could it be that the blockade was all about regime change in the name of free markets for US interests? Could it just be that Cuba was not much different than Hawaii, and Puerto Rico, and Guatemala, and Panama, and all of Latin America? Could it be, could it just be, that anyone who stands for improved relations with North Korea yet against ending the Cuban embargo is a hypocrite?